Anyone who has children knows how difficult it is to get them to eat their vegetables. As our doctor once said, the golden age for children is up to the age of 18 months following which their love affair with vegetables abruptly comes to an end. From then onwards it becomes a struggle to get them to eat their greens. In an age where a lot of emphasis is being placed on food provenance and where knowledge of where our food comes from is not so common, an app was launched earlier this year featuring Henri Le Worm. The app aims to teach children about food in an entertaining way. It is a really well made interactive application (available for Android and IOS devices) aimed at children aged between 2 years and 8 years and features a number of characters including Henri Le Worm, Derek the Ladybird, Sebastian the Intelligent Slug and Texas Lou the Spider. The colours are vibrant and app is very interactive. It allows children to click on vegetables in a garden and get interesting facts about them, to sift flour in a sieve while trying to make pancakes, help Henri le Worm prepare breakfast for his friend, and watering seeds to watch them grow into fruits and vegetables. I have reviewed books in the past but this is the first time I write about a food app because it clearly is a very entertaining and educational one for children. While the target age group is rather varied, the application has very interesting features which should ensure that it is attractive to children of various ages. Recipes have been created by well known chef Raymond Blanc. The 10 recipes are aimed to get children to cook with their parents. The application was co-created by Raymond’s son Olivier who worked with illustrator Charlot Salt. They say that the aim of the app is to try and get children to reconnect with nature and food, not by preaching to them but by primarily trying to make them laugh. It is partly a storybook and partly a recipe collection. The story is about a cooking competition and how Henri Le Worm’s cookbook goes missing. 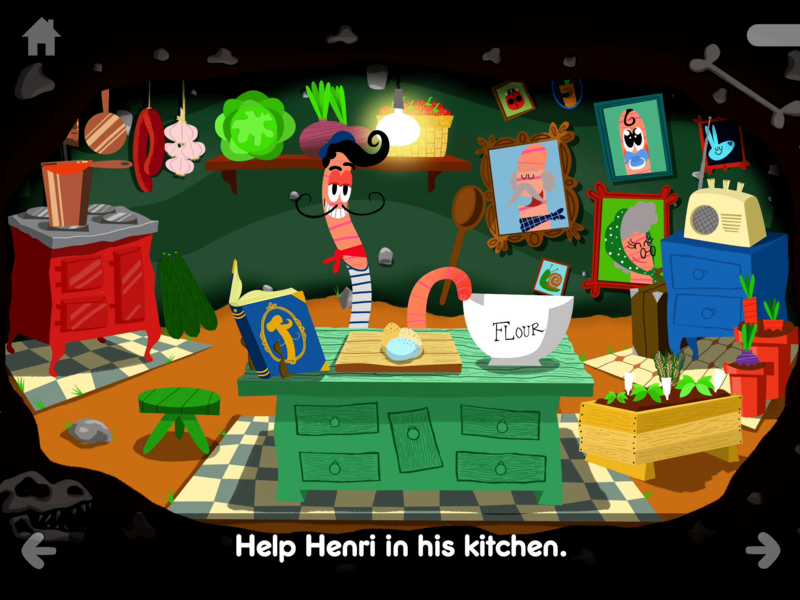 The theme tune of the app ‘My Name is Henri Le Worm’ is also very catchy and sure to be a winner with children. Anyone who is familiar with Raymond Blanc’s very successful programmes on television will find a certain familiarity with Henri Le Worm, particularly in the expressions used by the character. The story telling and voices of the characters are provided by actor Simon Pegg. The producers of Henri Le Worm say their aim is to establish themselves as the go to brand for kids cooking and gardening. The have piloted the app at the Charlton Manor Primary in the UK. They plan to upload a lesson plan in the near future with will be specifically designed around the app for teachers to download. You can also download a seasonality chart from their website. If you have children, this app is highly recommended.